A Utah dad brought the Christmas tradition to life using his adorable four-month-old son. 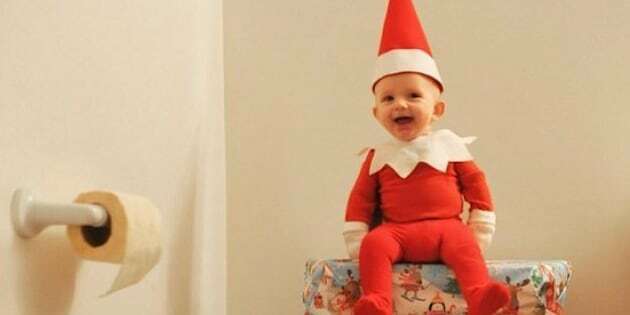 A Utah dad turned his four-month-old son into the most adorable real-life Elf on the Shelf we’ve ever seen! Photographer Alan Lawrence was inspired to bring the tradition to life with his son Rockwell after he heard stories from his friends. “All of our friends do the Elf on the Shelf and I've always thought it was sort of creepy, but sort of fun — this idea of an elf coming to live in your home and moving around to different places,” the dad of five told Today.com. Lawrence’s wife made Rockwell’s adorable costume and the dad began snapping photos. On his blog, “That Dad Blog,” Lawrence crafted a fun story about their real-life Elf on the Shelf and stated that he would be documenting the scout’s stay until Christmas. So far, the mischievous elf has gotten into all sorts of trouble, including jamming cookies in the VCR and teepeeing the Christmas tree. If you’re wondering how this little one manages to balance himself in these photos, Lawrence explained that he poses with his son in the pictures and edits himself out later. This isn’t the first time we’ve seen the Elf on the Shelf come to life! Just last week, a New Brunswick dad made headlines with his creepy real-life version, and a three year old named Willow, known for her epic Halloween costumes, is back again this year with more adorable Elf on the Shelf mischief.